Although we continue to use Skandha4 for a few demos, it is no longer under active development. Its functionality has been superseded by various other projects, especially MindSeer, a 3D Visualization tool written in Java. Skandha4 was used to develop a number of SIG projects, including the Brain Visualizer and the Dynamic Scene Generator. 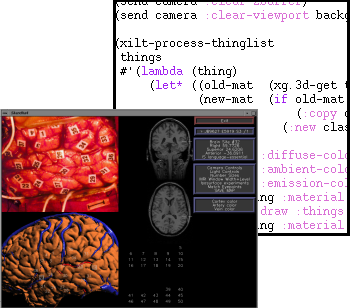 Skandha4 is "an emacs for 3D graphics"-- a portable shaded-polygon graphics extension to the Slisp toolkit which provides a variety of pre-built facilities on which specialized graphics applications may be quickly built. These facilities include a flexible relational datastructure for geometry which may be easily extended to add application-specific information, a pointwise arithmetic sublanguage over these relations, picking and animation support, a (truly!) 3D widget library, and a growing collection of primitives for such things as voxel and image processing. Xlisp, a small Lisp interpreter written in portable C by David Betz. Around the lab, if someone refers to "Skandha" (with no number), they generally mean Skandha4. Skandha4's graphics functionality was originally developed using GL on Silicon Graphics hardware. In 1999, Jeff made some major revisions, adding Open GL drivers so that the program could be compiled and run under Linux. Skandha4 was developed primarily by Jeff Prothero, based on David Betz's Xlisp. Additional development has been done by Andrew Poliakov, Kevin Hinshaw, Ben Wong, and Jim Brinkley. Check the Skandha4 downloads page. J. F. Brinkley and J. S. Prothero, "Slisp: A flexible software toolkit for hybrid, embedded and distributed applications," Software -- Practice and Experience, vol. 27, pp. 33-48, 1997.